your bet-at-home.com Affiliates Team had again a strategy meeting that takes place two times a year. On this day, we get out of our office and our daily routines to spend the day together in a meeting room to take a closer look at the last six month, as well as to plan and discuss important topics of the next half-year. This meeting helps us to think out of the box, develop new ideas and discuss opportunities for promotions and campaigns. To boost our creativity, it was of course important to feed our brains with delicious food. Thus, lots of fruits and a self-baked cake were available for us. At lunchtime, we took a walk and went to a restaurant nearby to get lunch and some fresh air. By the way, we are always looking for new campaigns for the football season in August. When you have new ideas, or when you need support, just contact us and send a message to affiliate.en@bet-at-home.com, we are always happy to help. Please note that the next promotion to receive extra money is already planned and coming up soon. To be up-to-date, just subscribe to our blog and to our newsletter. If you do not receive our newsletters, check if you are subscribed to it (log in to your affiliate account, click on “my account” – “subscriptions” and check, if the newsletter subscription is ticked). 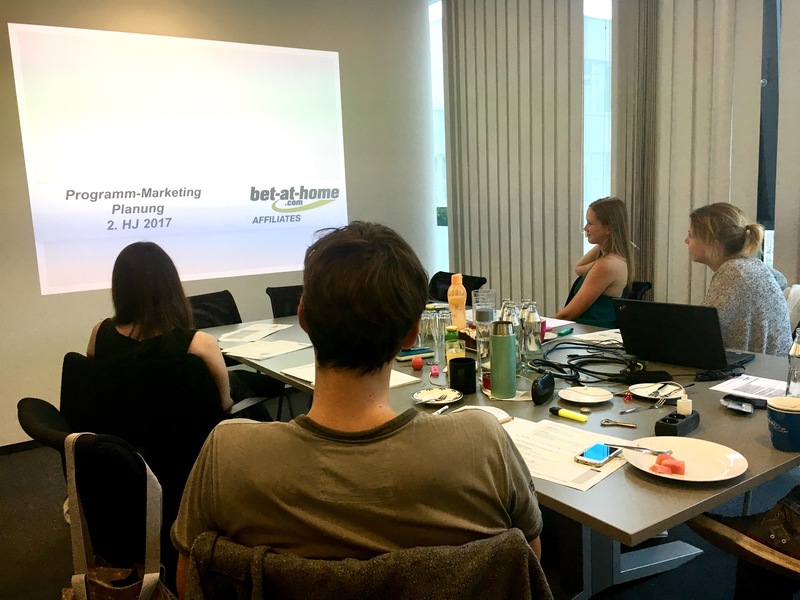 unser bet-at-home.com Affiliates Team hatte letzte Woche wieder ihr halbjährliches Strategiemeeting. An diesem Tag begeben wir uns außerhalb unseres normalen Büroalltages und verbringen einen ganzen Tag damit, gemeinsam das letzte Halbjahr rückwirkend zu betrachten, sowie das kommende Halbjahr zu planen und wichtige Themen zu besprechen. Dieses Meeting hilft uns quer zu denken, über den Tellerrand zu schauen, neue Ideen und Möglichkeiten zu Promotions und Kampagnen zu diskutieren. Natürlich ist es an so einem Tag besonders wichtig, das Gehirn ausreichend mit Leckereien zu füttern, um die Kreativität zu fördern ;). Daher wurden wir reichlich mit Obst und selbstgebackenem Kuchen verwöhnt. Zu Mittag besuchten wir dann zu Fuß ein Restaurant ganz in unserer Nähe um etwas an die frische Luft zu kommen! Wir sind immer auf der Suche nach neue Kampagnen für den kommenden Ligastart im August. Solltest du neue Ideen haben, oder unsere Unterstützung benötigen, melde dich einfach. Wir freuen uns über deine Nachricht an affiliate.de@bet-at-home.com und helfen gerne weiter.